The purpose of our work is to understand the ultrasound backscattering by tumors. The cancerous tumors often result from the proliferation of abnormal cells forming a growing mass. 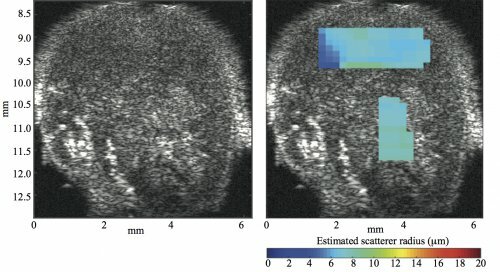 The classical ultrasound scattering models used by the cellular structure estimation technique assume that the scatterers are randomly and independently distributed (i.e. diluted media), whereas the tumors can be considered as concentrated media. The scientific challenge is to answer the following questions : what are the scattering models adapted to densely packed cells ? What are the main structures responsible for the ultrasound scattering by tumors ? The purpose of our work is to understand the ultrasound backscattering by tumors. Our hypothesis is that a scattering model considering the interference effects caused by the correlations among scatterer positions (i.e. considering the coherent scattering) may help to estimate QUS parameters with better accuracy on densely-packed media. The structure factor model considers the coherent scattering by summing the contributions from individual cells and modeling the cellular interactions by a statistical mechanics structure factor. Our group performed experiments on tissue-mimicking phantoms and cell pellet biophantoms to show the superiority of the structure factor model in comparison with other classical models that do not take the structure factor into account (i.e., the Gaussian model or the fluid sphere model). One year PostDoc position in ultrasound is available in the Laboratory of Mechanics and Acoustics – LMA (France) on the project : Live single cell sensing using high frequency ultrasonic scattering measurements.